Lower air pressure provides a smoother ride, however will make the stroller slightly more difficult to turn and manoeuvre and also reduces the tread life of your tyre. Do not use a service station pump to inflate your air tyres. The pressure is too strong and can result in bursting the inner tube. Sometimes low air pressure or a flat tyre can be the result of trapped dirt in the tyre valve. Clean the valve by inflating and deflating rapidly to clear any potential dirt from the valve. Reinflate to see whether the dirt was the cause. Heat can affect tyre pressure, especially when your stroller is left in hot environments like your car boot. Take care not to over-inflate your tyre. Tyre tubes are often stocked at cycle or specialist wheel shops, as well as via our website. 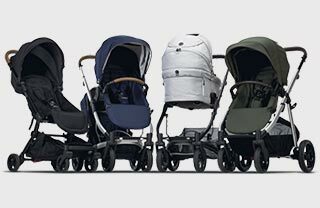 What are the wheels made of on the JIVE² prams?